This chart shows anti-Semitic content posted on Twitter in the UK between October 2015 and October 2016. In total, HateLab identified 9,008 original tweets as antagonistic, representing 0.7 per cent of the 1,232,744 original tweets in the UK dataset. This is commensurate with the volume of antagonistic tweets related to Muslim identity following the Woolwich terror attack (0.9 percent; see Williams and Burnap 2016). The highest peak in the production of anti-Semitic content on Twitter was around 28th April 2016, the period when Ken Livingstone was suspended from the Labour party over his comment. Over the past decade social media has become a safe harbour for launching campaigns of anti-Semitism, including harassment and criminal threats directed at members of the Jewish community in the UK. Of Community Security Trust‘s (CST) total recorded anti-Semitic incidents in 2016, 22 per cent were committed via social media. The online pattern of antagonistic content related to Jewish identity can act as a proxy for the ebb and flow of negative expression targeting Jews in the UK. HateLab analysis shows significant variability in the frequency of antagonistic tweets related to Jewish identity over the 12-month study period. The frequency of antagonistic content was on average 32 percent higher in the second half of 2016, compared the the first half before the Labour story broke. CST found a similar sustained increase in incidents reported both on and offline in the same period. HateLab analysis found accounts identifying as anti-Semitic were most likely to produce antagonistic content, while verified and media accounts were least likely. Statistical models revealed that anti-Semitic content was least likely to be retweeted in volume and to survive for long periods, supporting previous research on the ‘half-life’ of hate speech on social media. While information flows emanating from anti-Semitic accounts were unlikely to propagate in terms of volume, a minority were likely to last between 3 and 7 days in the analysis study window. The small (in terms of retweeting) but sustained (in terms of survivability) information flows of a minority of anti-Semitic accounts indicates that there is limited endorsement of these Twitter narratives. Yet, where there is support it emanates from core group who seek out each other’s messages over time: a likely ‘echo chamber’. Therefore, contagion of anti-Semitic information flows is contained and unlikely to spread widely beyond such groups. 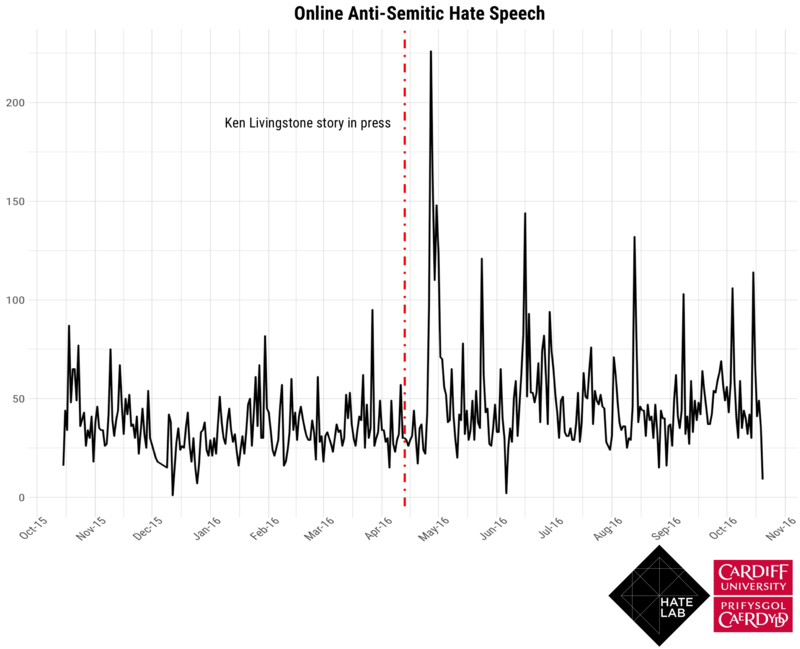 HateLab analysis also revealed that information flows emanating from Jewish organisations and media gained significant traction online, indicating that these outlets are potentially viable vehicles for the production of counter-hate-speech following events, such as the breaking of the Ken Livingstone story.